Since Oxygen is produced by photosynthesis, would there be less oxygen in the air in winter, where the trees shed their leaves and the sun generally shines a lot less? If yes, would that be a noticable difference? Pretty interesting question: The short answer to it is: Yes, the seasonal O2 levels vary with the season and this can be measured. The paper in reference 1 says that this is connected to two phenomena: Production of O2 by photosynthesis and also the uptake and release of O2 in the oceans due to higher temperatures (warmer water dissolves less gases). 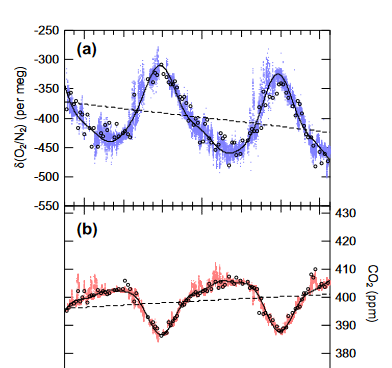 The paper in reference 2 says that the northern and the southern hemisphere are basically decoupled from each other. The northern hemisphere reaches its peak of maximum O2 concentration in June/July while the southern reaches its peak around January due to the slow mixing in the athmosphere. They also say that due to more ocean area on the southern hemisphere the uptake/release processes in the ocean play a much more important role there. The graph from paper 3 also shows that the CO2 concentration is inverse compared to O2, since during the photosynthetic period of the year CO2 is consumed. The following figure is taken from the website of "2° Institute" and is interactive, so can actually check, when the concentration is at which level. 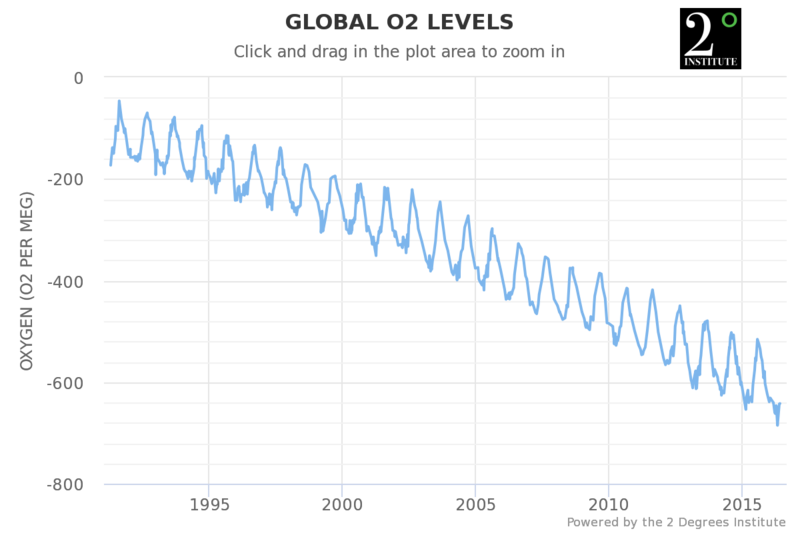 The general O2 concentration is getting lower, it is assumed that this happens due to the human CO2 production, the source can be found here.